MONCTON, NB – The Crandall University Faculty of Business Administration awarded its Gold Medal for exceptional achievement in business at Saturday’s Convocation ceremony to graduating students Sabryna Schurman of Cardigan, PE, and Noah Lohnes, of Fredericton, NB. Sabryna, who completed her BBA in Management, graduated with an A level GPA, and distinguished herself through leadership of the Business Society, where she served as President, and as a Vice President for the Student Association. Keen on integrating her Christian faith with business practice, Sabryna has been accepted into the University of New Brunswick Faculty of Law where she plans on pursuing her dream of becoming a lawyer. Noah also distinguished himself academically, posting an A- level distinction, and earning a BBA in Management. Seeking to fully integrate a Christian perspective into every aspect of his experience, he served as Vice President and Ethics Director of the Business Society, and as a student representative to the University’s Marketing Committee. Noah has been accepted into the Master of Divinity program at Acadia University, where he will continue his studies in pastoral ministry. This marked only the second time in the history of the award that the Faculty of Business Administration Gold Medal was awarded to two members of the graduating class. Established in 2006, the honour is bestowed annually and based on, in the consideration of the Faculty, the effective integration of the Christian faith and the study of business, a positive and significant impact to the University and the community, and demonstrated excellence in academic achievement. The Crandall University Faculty of Business Administration offers concentrations in Accounting, Management, Marketing, Economics and Finance, and General Business Administration. The Faculty’s motto “Excellence. Integrated.” speaks to its goal of being a global leader in the provision of values-based business education. Crandall University, located at 333 Gorge Road, is a Christian liberal arts and science university with a mission of “transforming lives through quality university education firmly rooted in the Christian faith.” Undergraduate degrees are available in Arts, Science, Business Administration and Education. Graduate degrees are available in Education and Organizational Management. For more information visit our website at www.crandallu.ca or call 1-888-968-6228. 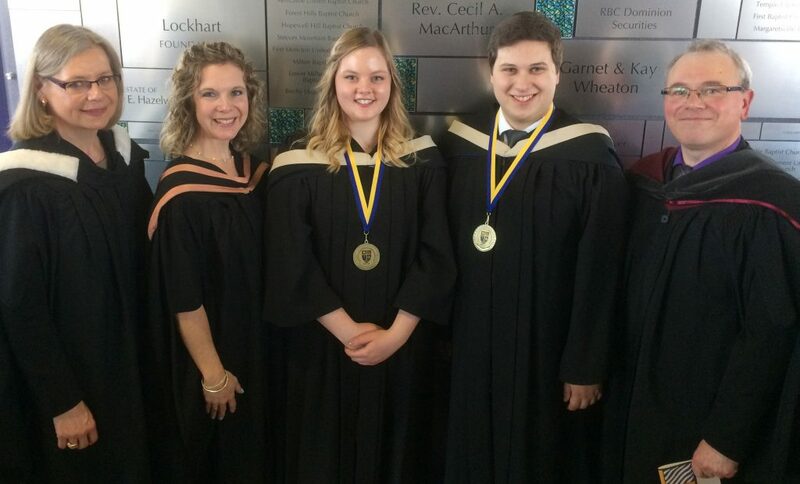 Crandall University Accounting Professor Heather Steeves, Marketing Professor Amy MacArthur, Faculty of Business Gold Medal Winners Sabryna Schurman and Noah Lohnes, Management Professor Robert MacDonald.